Once they feel they can trust their higher selves and spirit guides, and feel they are being directed to the symbols and imagery in Tarot, which will kick start the required information to be revealed, they will be confident to do Tarot readings. A good teacher will always encourage a student to be guided by the way the Tarot talks to them, and not just by learning ‘parrot fashion’ the many meanings each card may have. It is the language of symbols which helps us more easily tune into the unconscious mind, especially when there is not always time available to spend many hours doing psychic development, and going within and meditating before a reading. 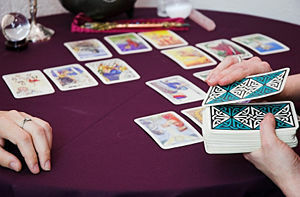 Many Tarot readers work with various spreads, or layouts, to help them answer specific questions and to define events, timing, important influences and important people in the questioner’s life. Tarot helps us find clarity as to the direction in which we are headed and even helps identify blocks which may lie ahead. I have in my collection at least fifteen Tarot decks, but one or two would suffice for most people. I just love the way talented people have been able to bring Tarot to life in their own Tarot deck design, using their own imagery, shapes and color. For centuries there has been a fascination with the Tarot. The most popular belief is that Tarot originated in the Italian Renaissance as a card game, gradually becoming used for divination. I’ve tend to use different decks for different types of questions or readings. For example, I’ve noticed how I grab my very ‘pink’ deck for love and relationship questions. Then of course, clients who come for private sittings have their own favorite deck and quite swiftly make it known if you haven’t used their ‘old favorite’ during the session! The Ryder-Waite is probably the most famous and a great deck for beginners. The most important thing is that you feel that special connection with your Tarot deck and that your preferred cards talks to you. There will always be people who are frightened by the metaphysical power of the cards and the knowledge they bring. Some people believe that occult powers of negative energy control the cards or even the reader, but the Tarot is only a tool which can help us more easily access the intuition we are all born with. 3 Responses to Can Anyone Learn The Tarot? I have never used tarot cards myself but I have had readings done when someone used them on me. I would like to learn how to use Tarot cards. Shani always makes these mystical topics accessible and user friendly for all who are interested or curious. thank you so much for sharing your down-to-earth wisdom with us Shani.